We are co-founding the Web3Infra Alliance with the aim of creating an open developer platform for Web 3.0 applications that thrive in a decentralized and shared economy. This alliance is being founded by four leading blockchain projects with strong developer offerings — covering software development tools ranging from data and file storage, data transmission, content delivery, to domain name service. Today, almost all application developers rely on centralized services for the 2nd, 3rd and 4th stages of their application development. It includes infrastructure services such as file storage, database, CDN; a platform to deploy the production system to; a naming service of your web application. These centralized services are not only costly, but also introduce single points of failure. In many cases, these centralized services bring about strong forces of censorship and control, depending on the jurisdiction that applies. For example, certain forms of communication that the government might not favor could be forcibly banned from a centralized system. Such localized forms of control are highly undesirable and counter-productive. What if you could focus on essentials such as business logic and great user experience, while the decentralized infrastructure took care of the rest? 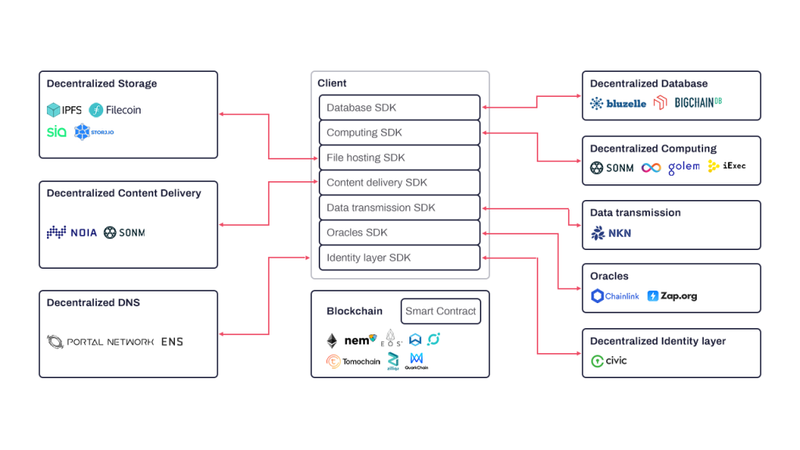 The Web3Infra Alliance aims to provide you with development tools, hosting, and deployment automation to create a common SDK and decentralized infrastructure for developing and deploying the next generation of applications. NOIA Network — Network Of Internet Acceleration — a distributed content delivery layer (CDN) that utilizes a widely dispersed edge node network in order to increase Internet performance. NKN — a peer to peer networking protocol powered by a shared economy that enables individuals and carriers to trade unused bandwidth, and applications to send data directly to each other without centralized servers. Portal Network — Portal Network aims to build decentralized domain names for the New Internet with surrounding platforms to improve both technical (KAIZEN) and non-technical (MUMEI) user adoption. To achieve the ambitious goal of the Web3Infra Alliance, we intend to natively integrate the four founding projects’ SDK’s on the KAIZEN platform. KAIZEN empowers users to learn, deploy, run, and manage decentralized applications utilizing multiple languages and frameworks. We believe the moment is right for such an alliance to be formed. The Web3Infra Alliance will accelerate the adoption of blockchain technology by providing a platform to create Decentralized Applications (DApps), and therefore, increase the amount of working use cases across the globe. This marks a new beginning for the industry and will give rise to a new wave of opportunity. Originally published at noia.network on February 11, 2019. NOIA is a widely distributed and decentralized layer of the internet's infrastructure. Empowered by blockchain technology and AI, it enables everyone to supply their unused storage and bandwidth to optimize the way the Internet functions.